Due to unprecedented interest and widespread support, our latest issue (on decolonization) sold out within a few weeks of its launch. But fear not! In a rare move, we’ve returned to our local print shop to print more issues of the magazine. 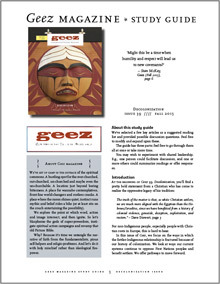 If you missed out on this important and timely issue, Geez 39 is back in stock at Geezmagazine.org/store. For those who would like to learn about decolonizing Christianity with family, friends or a church small group, we’ve put together a 4-page PDF discussion guide. In it, we offer simple suggestions for approaching the issue and some discussion questions to keep conversation flowing. Find a PDF here. If you’d like to place a bulk order of 10 copies or more contact Tim at subscriptions [at] geezmagazine [dot] org for a 20 percent discount. Thanks for your support. We hope this issue of Geez inspires action and important conversations about the role of Christianity in North America.